“After 35 years of struggling with emotional eating and trying every remedy and healing modality I could search out, it was a huge relief and blessing to find Julie’s program. She has done all the work of addressing the issues from every angle and putting all the pieces of the puzzle together, leading the way out to freedom in a clear and logical step-by-step manner. Having been an emotional eater herself, she truly understands the thought patterns, emotions, and struggles that we all experience, and, best of all, has assurance that there truly is a way out, and that anyone who follows her program and practices the skills she teaches can, and will, get there. The beauty of her program is that the principles can be applied to any area of our lives involving compulsive behavior, not just eating. Every healing advice that I have ever heard says that you must begin with loving yourself — however, I have found Julie to be the only one who was ever able to give real, practical instructions on how to actually do that. Every part of her program just makes sense, resonating with truth, and striking to the core of the deepest needs within us. 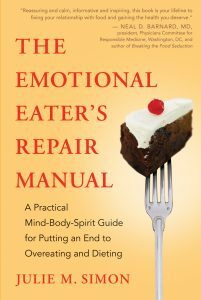 “I am very thankful for Julie Simon’s published book “The Emotional Eater’s Repair Manual” and her 12 Week Emotional Eating Recovery Program. Over the last few years I have come to grips with my poor health, improper diet, and dismal hope of recovering from compulsive overeating. In the past I attended support groups that provided me comfort because I learned I wasn’t the only one struggling with this affliction; however, there was something missing from them-true recovery. Although the support groups provided books that thoroughly explained how compulsive overeating could be managed, the people in attendance were just as weak as myself and so I still felt like a victim with no way out. These wonderful individuals had attended these support groups for decades but were still trapped in the vicious cycle of binge eating and low self-esteem. I prayed to God to help free me from the burden of living a life so sad and lonely. God answered my call and brought me Julie Simon. I attended Julie’s 12 week program and read her book. It was the glimpse of hope I was longing for. Julie is a living breathing testament to a life after compulsive overeating. Her book helped me discover that being overweight isn’t the problem but is the symptom of a greater issue. As we progressed further through the readings the book opened parts of me that remained untouched since childhood. I was able to finally tap into emotions and deal with life in a way I never could before. Julie’s book gave me a new foundation to stand on because the old one was no longer viable. I recommend everyone with an eating disorder to read Julie’s manual because it gives you the tools you need to rediscover yourself. Yes, you have to be open-minded to Julie’s philosophies because they may be different from what you have ever been told. I walked into her program with an open mind because relying on myself for healing was getting me nowhere. I decided to trust Julie because she is a person who inherently understood the dilemma emotional eaters face and through the methods outlined in the book saved herself from a life of health issues, depression, and everything else that comes with the pre-mature death of people like us (as an obese person I felt like the walking dead). 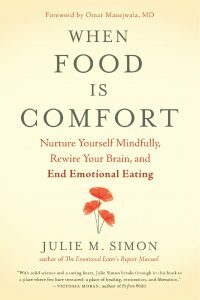 “When I stumbled across Julie’s book, I was hopeful that it might be different than all the other books I’d already read on the subject of emotional eating. I am so glad that I took a chance on yet another book! Her book was so different from all the others – addressing the mind, body and spirit together to help conquer emotional eating. When I discovered that she taught classes and seminars I was a little hesitant at first, as speaking in groups makes me feel nervous and vulnerable. But after reading her book, I felt that she really understood what I was experiencing, and I felt that I needed to dig deeper and learn more.